Daimler AG Chief Financial Officer Bodo Uebber’s decision to leave the maker of Mercedes-Benz luxury cars marks the first top-level departure after the German manufacturer picked Ola Kallenius as CEO starting next year. Uebber, 59, informed supervisory board Chairman Manfred Bischoff that “he is not seeking to extend his current appointment,” Daimler said in a statement late Oct. 7. It didn’t provide a reason for the planned departure. His contract expires in December 2019. Uebber was seen as a candidate to lead a holding company that bundles the three separate Daimler units. But the supervisory board’s decision last month to give Kallenius, 49, the same dual responsibility that veteran leader, Dieter Zetsche, currently has as CEO and head of the Mercedes-Benz cars unit indicated this scenario was unlikely to materialize. The management change comes at a critical time for the world’s bestselling luxury-car maker and biggest producer of commercial vehicles by revenue. The challenges were evident Oct. 8 when Mercedes said September deliveries slumped 8%. More complex emissions procedures took effect in Europe that month, triggering production bottlenecks that contributed to the decline. Audi was even harder hit, with its worldwide deliveries tumbling 22%. Mercedes sales also were hit by delays in certification in some international markets and by model changes, the company said. Uebber has been one of the key architects behind Daimler’s new group structure, which was created to give its cars, trucks and mobility-services units more independence. Shareholders are set to vote on the changes at the annual general meeting in May next year. 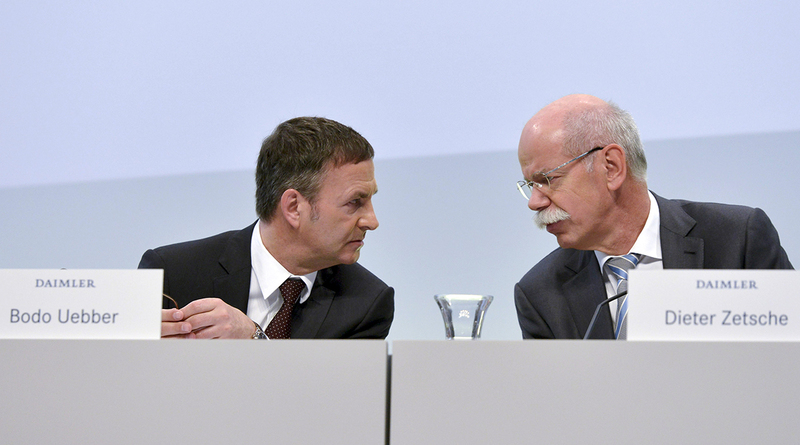 Zetsche last week defended the strategic logic behind the biggest corporate overhaul in a decade. He told reporters in Paris that the proposed revamp should boost efficiency and eventually help turn around a stock slide that’s erased a fifth of the company’s value this year. The shares fell 1% to 55.07 euros at 12:05 p.m. Oct. 8 in Frankfurt, taking losses to 22% since the start of the year. Investors have balked at the new structure and called for deeper changes, including separate listings of the trucks division or parts of the mobility-services operations. Daimler officials have denied plans for a complete divestment of any subsidiary but left the door open for a partial sale. The overhaul also has been criticized for its cost, earmarked at around 1 billion euros, and for having too little instant benefit to the company’s valuation. Uebber joined Daimler’s management board in 2003 and took over responsibility for finance a year later. Kallenius, the first non-German to take the helm of Daimler, will become CEO in 2019. The Swede already was the heir apparent to long-serving Zetsche, who has faced increasing headwinds this year with the adoption of new emissions tests, a German probe into Mercedes diesel engines and growing trade barriers between key sales regions.